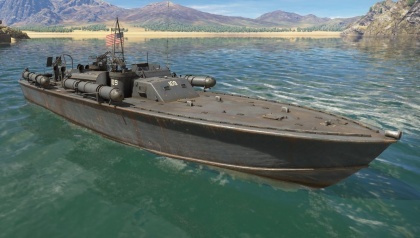 The Elco 80 ft PT-109 is a gift rank II American motor torpedo boat with a battle rating of 2.0 (AB/RB/SB). It was one of the earliest pre-orders offered to access the fleet closed beta test before being removed from the store with the wide-release of the closed beta test in Update 1.79 "Project X". The hull structure of the boat has no armour at all. The only armour present on this boat is the bridge that contains 6 mm of antifragmentation armour, and the 13 mm rolled homogeneous armour of the 20 mm mount. Most of the front hull is open space and so there are not critical components that could be hit if rounds come in across at the front end. However, from the bridge on backwards is the engine, ammo, torpedoes, and fuel all scattered around that could be easily hit, ignited, or detonated. Two turrets with twin-mounted AN-M2 machine guns are had around the bridge area. 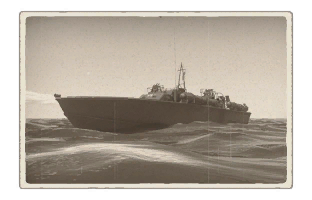 Despite their full-flexible 360 degree traverse, limitations with the boat structure will severely restrict their fire angles against enemy boats. A single 20 mm Oerlikon cannon is mounted at the stern of the boat. The PT-109 is armed with four 21 in wet-heating Mk.8 torpedoes, which are mounted with two on the port side and two on the starboard side. Both are angled from the front and so requires angling to get onto target. Elco 80 ft PT-103 - Head of the ship-class that PT-109 was built off.